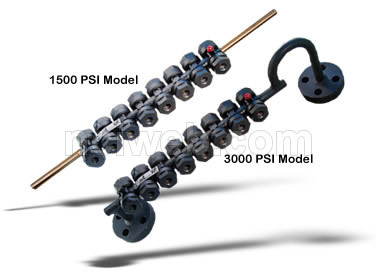 For 0 To 3000 PSI Steam Pressures In Six Standard Lengths. Models For Indoor, Weatherproof Or Explosion- Proof Installations. Stainless Steel Hoods Allow Increased Installation Versatility. Designed and manufactured according to rigid quality standards, the Clark-Reliance Simpliport can be depended on for accurate and easy water level reading throughout an extended service life. World wide, Simpliport has delivered outstanding performance in dependability, low maintenance and installation versatility. To meet specific requirements, Simpliport is offered in six standard visibility lengths from 10¼" to 22-1/8". Special gages of longer visibility can be supplied. In all lengths, gage ports are tightly spaced for maximum reading accuracy. All standard illuminator ports are brilliantly illuminated by individual 50-watt tungsten-halogen lamps. Low Maintenance Simpliport 's low maintenance factor is demonstrated by the ease of replacing individual gage glasses. Nuts are retightened with a torque wrench, free of any possibility of harming Glass Disc Module components. Stainless steel body and hoods, plus other quality materials throughout, also add to low maintenance and product durability. Operating on reliable principles of light refraction, the Clark-Reliance Simpliport is a fundamentally accurate bi-color gage. Light does not refract through water on the same line that light refracts through steam. Therefore, by calculated placement of a light source, colored glass filters and gage glass, the Simpliport indicates water levels by displaying green ports at water level and red ports for steam above. When the level is partially within one port's area, the port will divide its color horizontally to indicate the exact water level. Simpliport Gages Have Been Installed Worldwide Since 1962 ! Quality construction is a Simpliport mainstay. Gage bodies are manufactured from Type 304 stainless steel. In addition, high quality materials throughout all gage components impart product integrity to even its smallest parts. The result is a premium gage, extremely strong yet lightweight. For example, the six-port Model P3006 with 12-5/8” (321 mm) visibility weighs only 16 lbs. New design features include the “all around” spring support for Glass Disc Modules. This provides positive and uniform loading to prolong the life of gage glass and the highest quality (V1) 30 mil mica shields. Service life may vary based upon actual operating conditions and water quality. For efficient, troublefree maintenance, Simpliport gages are furnished with two spare Glass Disc Modules, a 1-7/8” socket, a 3/4”-1/2” drive adaptor, high temperature thread lube, and module extractor pliers. * Modules have been unknowingly purchased by Clark Reliance customers. These modules have lead to severe in-service failures of the product. Clark Reliance has investigated these failures and discovered at least one industrial distributor selling "look alike" modules that were manufactured off shore. Legal action has been taken against this distributor. Please make sure your replacement parts are genuine Clark Reliance Replacement Parts.